K-Two Duo Muck Spreaders, available from Ag Machinery Specialists , have been manufactured to the same exceptional standard as the K-Two Spreader series, however the K-Two Duo range of spreaders incorporates the vertical beater principle. The key advantage of the vertical beater principle of spreading is that it can combine a high throughput with a wide and accurate spread pattern. Built to the same high standard and specification as the traditional K-Two Spreader range, the Duo series where the two major features are that of high throughput combined with a wide accurate spread pattern. Heavy duty construction and durable paint finish. 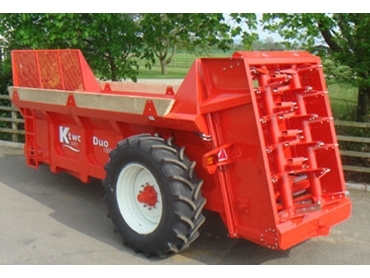 K-Two Duo Muck Spreaders operational costs are low when compared to traditional spreaders due to the constant discharge and high tonnage throughput. Each spreader features a robust one-piece rotor drive gearbox (1¾ inch Drive shafts) and Rubber Shock relief to rotor drive. The K-Two Duo series also include a variable floor speed control, where the maximum speed is achievable in reverse. Excellent body design with flared sides providing a 2m wide top.